A Blackberry is a personal communications device developed, distributed, and serviced by Research in Motion(RIM), a Canadian company headquartered in Waterloo, OntarioA .Blackberry can provide email, text messaging, web browsing, and telephone service. It is an example of a convergent device. A BlackBerry is an end-to-end wireless email solution that allows access to your Outlook Inbox, Calendar, Contacts, and Tasks with full wireless synchronization. The BlackBerry Server constantly communicates with the campus Exchange server (that talks to Outlook, among other email clients).As soon as something comes into your Outlook for Exchange email, the BlackBerry server gets a copy and sends it to your device through the Internet. Your device receives that information through the Internet using your carrier's preferred network. The process works in reverse when you make changes on your BlackBerry device that need to be copied into your Outlook account, e.g., if you send a message that needs to be copied to your Sent items, or if you add a contact to your Contacts list. 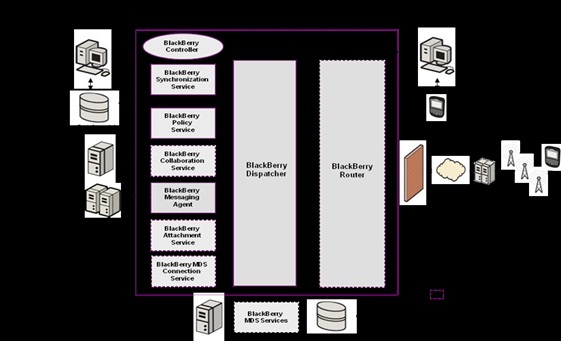 The Blackberry can be set up and operated wirelessly without ever being connected physically to a computer. RIM currently offers BlackBerry e-mail service to non-BlackBerry devices, such as the Palm Treo, through the BlackBerry Connect software. The original BlackBerry device had a monochrome display, but all current models have color displays . BlackBerry handhelds are integrated into an organization's e-mail system through a software package called " BlackBerry Enterprise Server " (BES). Versions of BES are available for Microsoft Exchange, Lotus Domino and Novell GroupWise. While individual users may be able to use a wireless provider's e-mail services without having to install BES themselves, organizations with multiple users usually run BES on their own network. Some third-party companies provide hosted BES solutions. Every BlackBerry has a unique id called BlackBerry PIN which is used to identify the device to the BES. BES can act as a sort of e-mail relay for corporate accounts so that users always have access to their e-mail. 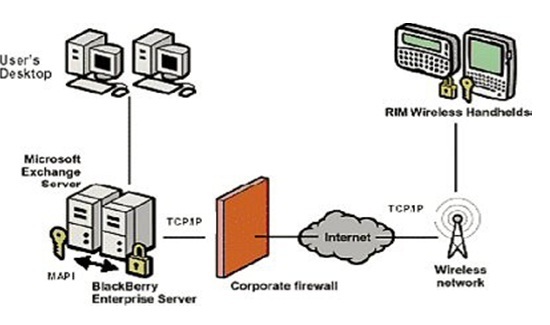 The software monitors the user's local "inbox", and when a new message comes in, it picks up the message and passes it to RIM's Network Operations Center (NOC). The messages are then relayed to the user's wireless provider, which in turn delivers them to the user's BlackBerry device. This is called "push e-mail," because all new e-mails, contacts and calendar entries are "pushed" out to the BlackBerry device automatically, as opposed to the user synchronizing the data by hand. Device storage also enables the mobile user to access all data offline in areas without wireless service. As soon as the user connects again, the BES sends the latest data. An included feature in the newer models of the BlackBerry is the ability for it to track your current location through Trilateration. One can view the online maps on the phone and see current location denoted by a flashing dot. However, accuracy of BlackBerry trilateration is less than that of GPS due to a number of factors, including cell tower blockage by large buildings, mountains, or distance. BES also provides handhelds with TCP/IP connectivity accessed through a component called "Mobile Data Service" (MDS). This allows for custom application development using data streams on BlackBerry devices based on the Sun Microsystems Java ME platform. In addition, BES provides security, in the form of Triple DES or, more recently, AES encryption of all data (both e-mail and MDS traffic) that travels between the BlackBerry handheld and a BlackBerry Enterprise Server . Most providers offer flat monthly pricing for unlimited data between BlackBerry units and BES. In addition to receiving e-mail, organizations can make intranets or custom internal applications with unmetered traffic. 1. The email message is sent. 2. Message arrives at your email server (usually the exchange server) and is sent as normal to your PC/ Laptop (as in fig 3.1). 3. The BlackBerry server (the mail is delivered using a "push" concept to the Blackberry Enterprise Server) compresses, encrypts and forwards the message automatically to your BlackBerry handset. 4. Message arrives at the BlackBerry via the Internet and the mobile carrier's network. 5. The Blackberry handheld device receives decrypts and decompresses the email, and alerts the user. BlackBerry Enterprise Server is the fully-featured BlackBerry mobile email service as in fig 3.2.1. It's designed for medium to large organizations with their own Lotus Domino or Microsoft Exchange servers for email and mobile data applications, that are going to start with at least 20 users and grow from there. BlackBerry Enterprise Server lets the user access his/her email, electronic calendar, tasks list and contacts list as well as any internal applications or software on their BlackBerry handheld. The BlackBerry Enterprise Server supports triple DES security (considered unbreakable) so confidential data is transmitted securely.